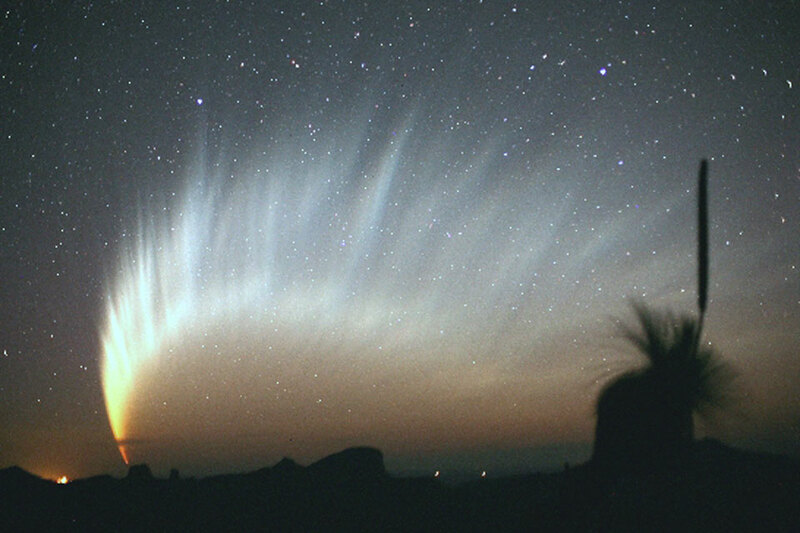 Explanation: Comet McNaught, the Great Comet of 2007, grew a spectacularly long and filamentary tail. The magnificent tail spread across the sky and was visible for several days to Southern Hemisphere observers just after sunset. The amazing tail showed its greatest extent on long-duration, wide-angle camera exposures. During some times, just the tail itself estimated to attain a peak brightness of magnitude -5 (minus five), was caught by the comet's discoverer in the above image just after sunset in January 2007 from Siding Spring Observatory in Australia. Comet McNaught, the brightest comet in decades, then faded as it moved further into southern skies and away from the Sun and Earth. Within the next two weeks of 2013, rapidly brightening Comet ISON might sprout a tail that rivals even Comet McNaught. The Magnificent Tail of Comet McNaught.